Has anyone else experienced patches on the driveway from under the front left of the Hyundai I30? 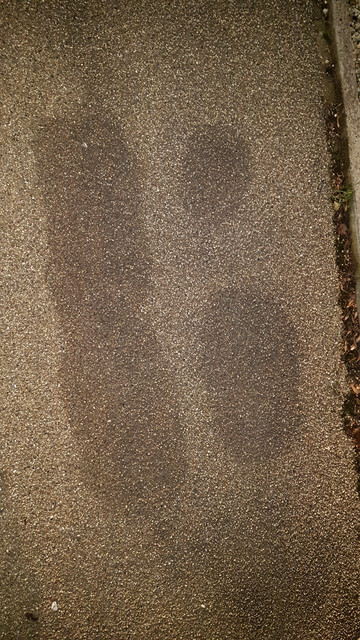 This has made 3 dark patches on my driveway and I cannot work out what it can be? I have placed several bit of cardboard/paper etc under and when checked appears to be just clear liquid?? However my concern is that these pathces dont clear up throughout the day amd have stained the driveway?? Leading me to believe this isent just water draining from the A/C? Dark patch ?? Darker than original surface or stained dark ? Any chance of a pic ? Our 16 GD leaves puddles on left from A/C . Have you checked battery ? Pic attached any ideas? This what it's like all the time. Hence the above about doesnt fade/disappear during the day. Strange! Does the fluid smell at all? Maybe try catching it in a shallow plastic container next time. I suspect it is just from the air con, but can't explain the permanent stains. Have you tried inspecting the underside of the car in that area at the time to see if you can see where it is dripping from? Are you due for a service soon. Get them to take a look in that area when it is on the hoist. When you say left side, is that standing in front looking towards rear or sat in car looking forward? Also, have you parked car in different position i.e. slightly forwrd back sideways? If so, are patches moved. I have caught some of the liquid and it was clear with no smell. Therefore hadnt been too concerned. However was slightly worried as to the patches seeming to not disappear. I have had a good look under the car and can not see any immediate signs however im far from a mechanic!!! That is taken from infront of where the front left of the car would be park. So the patches are under the front passenger seat insode the left front wheel. And yes would imagine its coming from the same place just differing parking on the drive. I think it must be water from the aircon then. Even clean water can leave a water stain in some circumstances. I had the same issue in the summer with the air con on cold, and the outside air was humid. Not sure how that works in the winter cooler temperatures. I use my air con all year round as it’s good for demisting during the winter and the temperature is set to warm so I’m not sure if the air con unit would still get really cold. Did you confirm air con liquid? With what was already mentioned being a clear liquid and no smell it'd be a given that it's just condensation from the aircon. It was his mention 'that didn't disappear' made me wonder if by chance something else other than air con condensation.